We have a full group this summer, with only full session Little Wohelo with any wiggle room for space. With such a big group of campers as well as limited working visas for some of our international staff we are looking for a few more cabin/activity counselors at both camps. Maybe you know the perfect girl, or maybe you have been considering spending another summer? 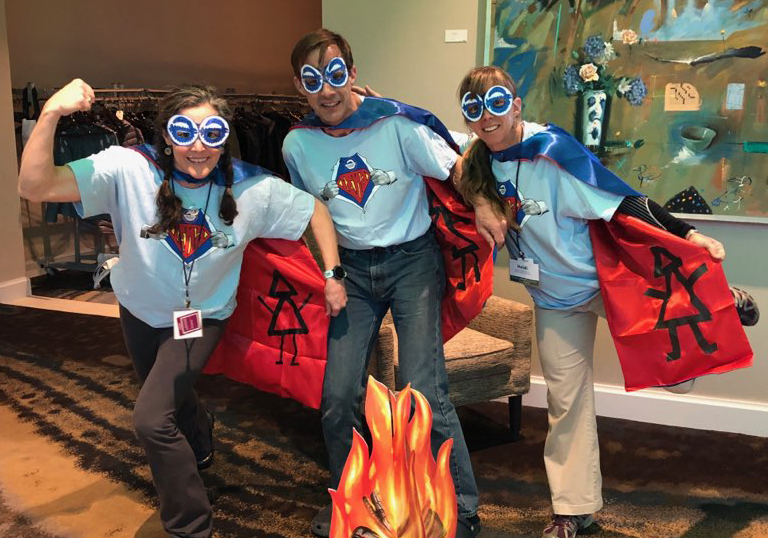 Above – Jennie, Mark and Heidi as Superheros at the New England Camping Conference this past week. Working at Camp is FUN! The lake frozen all the way across this month. Several alumnae came to cross country ski on the lake and Fritz got to try Kite Skiing. Thanks to everyone who passes along camp related news. Independent, responsible, collaborative, empathetic, willing to try new things. These are a few of the characteristics that we consistently hear parents and educators say students need to develop on their way to adulthood. We know from the research that social and emotional skills are linked to academic, career, and relationship success as well as with overall youth well-being, regardless of race or socioeconomic status. For several years, Challenge Success partnered with six California camps to study the benefits of attending summer camp. You might not be surprised to hear that camp is an excellent learning environment that can provide kids with rich opportunities to develop the social and emotional skills we know they need. Camp can also offer a needed break from technology as 90% of accredited camps are cell phone free. And, perhaps most importantly, 99% of kids in our own study said that camp is FUN! Watch this 4-minute video that highlights more about the value of camp based on our research. Need more evidence? Check out several research studies being conducted by the American Camp Association (ACA) to understand how camp leverages the power of fun to teach lifelong skills that impact future career readiness. And, read “All I Really Needed to Know I Learned At Summer Camp” from summer camp owner, Audrey Monke. and Maggie made it to the State Theater last week after missing it for Saturday Night Live this winter. A Wohelo crew here eating Holy Donuts with her before the show. After a World Tour including Coachella and Sydney Opera House, which is sold out already, she will be back in Maine this summer at Thompson Point. Tickets went on sale on March 29th, Radio City just sold out two nights in an hour, so don’t wait. Check your gloves, you might be due for a new pair…..